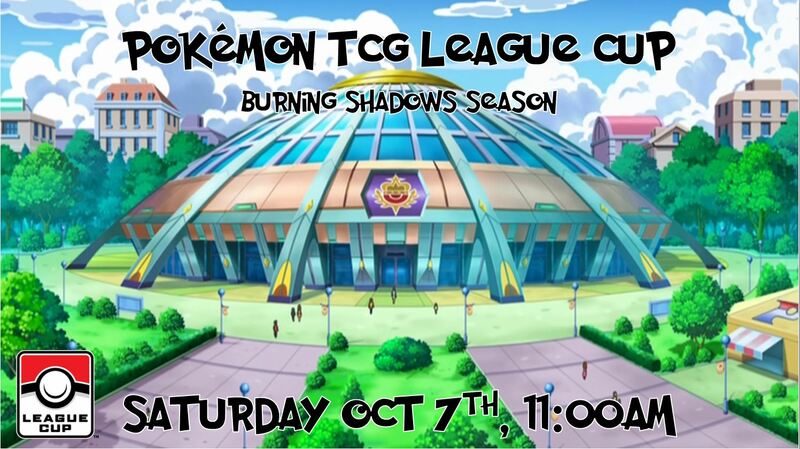 Join us for the Pokemon League Cup for Burning Shadows season! Pre-registration is encouraged. Please see our website for more details. Decklists will be required. Please try to save time by completing a deck list at home before the event. Blank lists will be provided at registration as well. This is a STANDARD format event. Total swiss rounds plus top cut will be based on attendance. Rounds will be standard 30 minute rounds, best of 1 (Plus 3 turns at time). Top cut rounds will be 60 minute rounds, best of 3 (Plus 3 turns at time). Additional prizes will be in the form of Burning Shadows booster packs. Juniors will have 3 packs per player in the prize pool. Seniors and Masters will be 4 packs per player in the prize pool. Also, players will receive Play! points based on standing.